If you are stressed and ready to reduce that stress (NOW! ), then you are going to love reading and implementing the tips and strategies in this brand new Get a Plan! Guide®. Written in Meggin’s straightforward, clear, and practical style, this Get a Plan! Guide® will help you learn a dozen specific ways to start dealing deliberately with your clutter – and then experiencing a reduction in your stress. Access the Get a Plan! 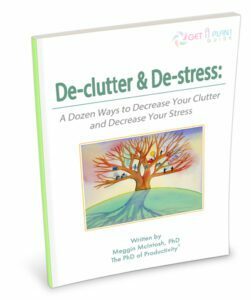 Guide® to De-clutter & De-stress: A Dozen Ways to Decrease Your Clutter and Decrease Your Stress, so that you can get started today with tools you will use to bring more peaceful, predictable productivity to your life at work and at home. Now available in either MP3 or PDF format! If you like reading and having a document to refer to, you may purchase and download this 40-page full-color Get a Plan! Guide®. Just click the order button that says PDF. 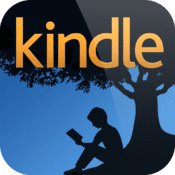 Once you check out through the secure shopping cart system, you will be redirected to a webpage where the PDF is ready for immediate download so you can begin reading and making notes. If you prefer to listen and learn, you may purchase and download the MP3 of the full publication (you won’t miss a word!) and listen at your convenience… as often as you like! Once you check out through the secure shopping cart system, you will be redirected to a webpage where you can immediately download the MP3 to save on your computer or other device. Copyright 2016, Emphasis on Excellence, Inc.
Want the Whole Kit & Kaboodle? The mission of the Get a Plan! Guide® series is to give you the ideas and inspiration to do your work easier, faster, and in a more focused fashion – so that you can accomplish your goals more smoothly, i.e., peacefully, productively, and predictably.